Home » Western » Steaks & Lobsters @ Sri Hartamas KL - Give Me More! 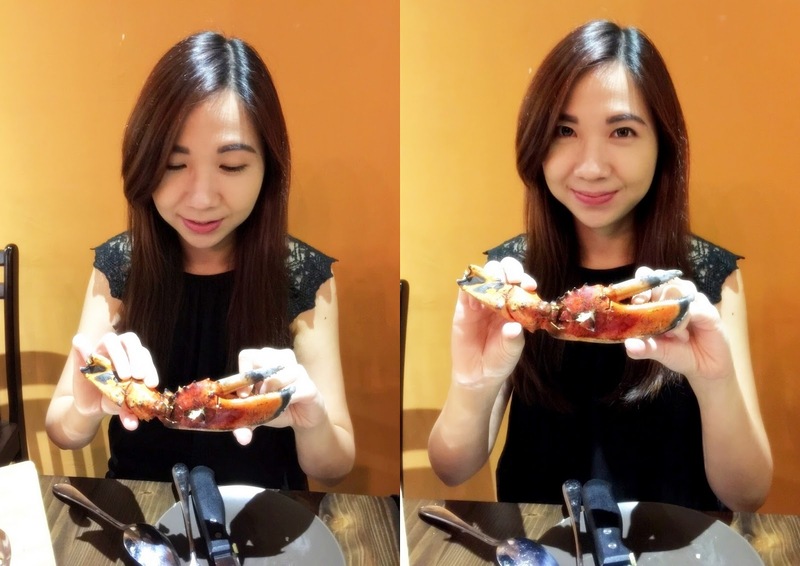 Steaks & Lobsters @ Sri Hartamas KL - Give Me More! Lets talk about ways to indulge on a lazy Sunday evening. You know something great is brewing when you see this sign at the entrance. The place is barely four-days-old! I was really excited when I found out that a new steak and lobster restaurant was opening in suburban Hartamas, and so does the rest of the meat-loving clan too I'm sure. I was eagerly looking forward to dinner tonight. There's a bit of everything here. If you're not a fan of lobsters and steaks (why not? ), there're a handful of pastas, salads, burgers and ribs in their menu. Full house on a Sunday evening! Drinks are not cheap here, starting from RM7.90 for a pot of tea, RM8.90 for a bottomless soda, to RM17.90 for a signature milkshake. Duck bacon milkshake anyone? Lychee Mojito (Rm8.90). Iced Honey Lemon Tea (Rm10.90). Lightly toasted bread with what I thought tasted like garlic butter and cinammon spread. What kind of ganja is this! Excellent battered portabella mushrooms served with one of the best smoky sriracha aioli, ever. Easily one of my favorite appetizer of the year! 300gm Grass Fed Sirloin. Rm48. My steak was beautifully grilled with a medium pinkish tone in between, neatly layed out on a chopping board together with some delicious refillable sides - potatoes, fries, coleslaw and salad. Tip: Order the sirloin for a juicy and fattier finish. Order the angus for chewier and firmer textures. Throughout the evening, a server walked from table to table, refilling these side dishes. It reminded me of a banana leaf restaurant! Signature Flaming Boston Lobster. Rm75. At first glance I thought, why so small? For sharing, do order the whole lobster (Rm140). The char-boiled lobster flamed with homemade aioli had succulent textures and sweet flavors, served with lemon bernaise sauce. You'd have to get your hands dirty for this one. Texas BBQ Beef Burger. Rm38. Tucked between a broiche bun, a well done beef steak patty, melted cheese, onion rings and a spat of spicy barbecue aioli. The best part for me would have to be the caramelised duck bacon bits - so good. Overall Rating: 8/10. All the dishes we sampled today were delicious. The steak and burger was good, and the lobsters felt a bit more American-styled, a tad saltier than your usual Chinese-styled ones. I like it salty! Moreover, it's really hard to beat a restaurant that has all of its sauces done in-house, each with a distinct taste and flavor of its own. The sriracha sauce especially, I couldn't stop thinking about that, and the portobello fries too of course. I'd have to say, this has been one great week for my food roll. Address: 42, Jalan 24/70A, Desa Sri Hartamas, Kuala Lumpur. Opening Hours: 5pm - 12am Daily. Closed Monday. Located right in front of Naughty Nuri's, or the row behind Naughty Babe Dirty Duck. The steak looks good, so does the burger!